PLEASE NOTE: This Website is under construction. Some LINKS might not operate. As we celebrate the 200th anniversary of Ebenezer Prouty Mason' birth on August 5, 1805, all of us are a family because of the incredible life of a farmer in Wayne Township, Erie County Pennsylvania who worked hard, went to church, and lived a very busy life. In looking at the Census records for our family it is interesting to follow the trail. 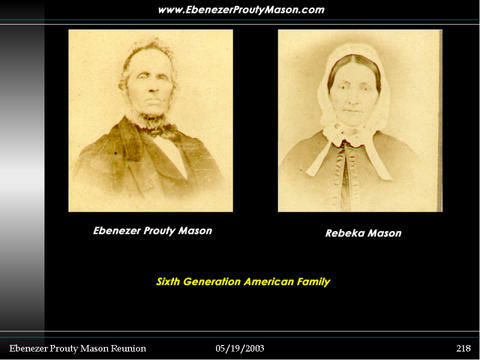 Here is a brief timeline of Ebenezer Prouty Mason and his family . If you think you have a hectic schedule, the person we celebrate on this Family Reunion 200th anniversary in 2005 was a very busy person. There is nothing in this time line about his grandchildren. This includes information only about his father, mother, three wives and his eleven children. REBECCA TAYLOR DIED 9/27/1857 IN WAYNE PA. Roll: T9_1129; Family History Film: 1255129; Page: 319D; Enumeration District: 178; Image: 0211.